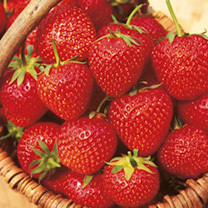 Taste test your home-grown strawberries from our Strawberry plants against any supermarket-bought variety and you will be amazed that you had not grown them before! 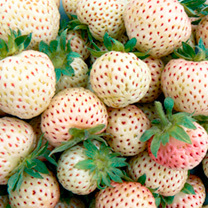 There are plenty of strawberry plants which you will want to grow such as the bright red Malwina, albino Anablanca or even the heavy cropping Elegance plants! 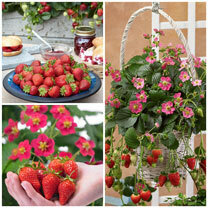 Browse our range of strawberry plants and try something different today. 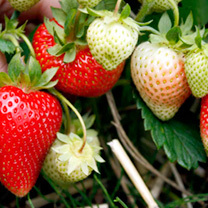 You can trust that your strawberry plant will be despatched at just the right time for you to successfully plant and grow it in your garden. Quality guaranteed! Before the advent of year round imports from abroad, this was the most anticipated fruit of the year. 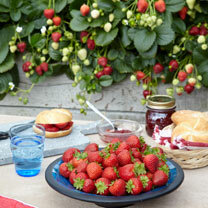 The sight of strawberry stalls along the road sides and in the shops, or in the garden really meant that summer was here. 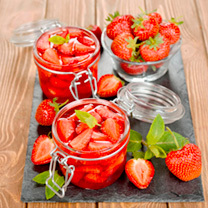 Even now strawberries and cream are synonymous with Wimbledon and summer days. 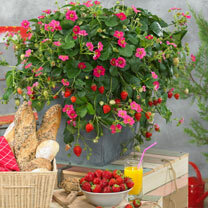 There are few plants more rewarding than the strawberry, ranging from big, juicy dessert types, smaller jam varieties, and the tiny, but intensely flavourful alpine strawberry. This little fruit is incredibly easy to grow, so simple that if you're not careful it will take over the garden. 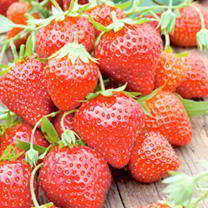 Strawberry plants require a sunny position, sheltered from the wind, and well drained soil that has been improved with compost. 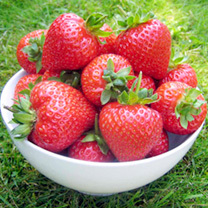 Plant your strawberries as soon as you get them and water in. 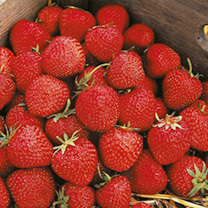 Planting through plastic will protect the fruit from slugs and earth splashes, alternatively mulch around the strawberry plant with chipped bark or straw when the fruit has set (if growing everbearers avoid straw as this can encourage fungal disease if used over an extended period of time). Keep weeds down and water regularly. 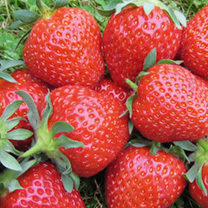 By planting a selection of early, mid and late season varieties along with an everbearer you can be picking strawberries right through from mid-May into October. 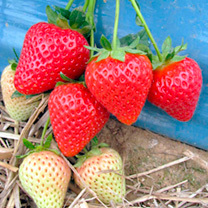 Do not plant where strawberries have recently cropped, as the chances of disease build up are increased. 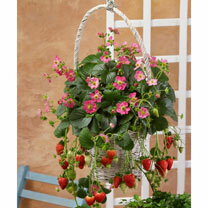 Strawberries do well in pots and hanging baskets, so its possible to grow them in the smallest spaces. 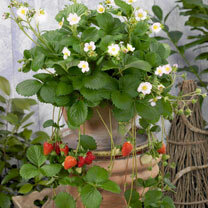 Module Strawberries are module plants grown on from last Autumn and flowering buds are already forming. Select an area in your garden, that should be sunny and with good drainage. Remove all perennial weeds and we recommend that you plant through a ground cover mulch to reduce weeding in subsequent months. Dig a hole and plant the module making sure that the crown ( the growing tip of the plant at the base of the leaves) is not buried. Water in to settle the plants. 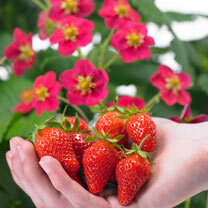 Plants will form flowers in June and we recommend you feed with tomato fertiliser when the small berries start to appear. 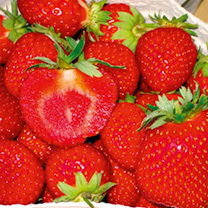 Harvest ripe berries from July onwards. Removal of any runners will maximise fruiting. In the autumn cut away any diseased or damaged foliage. In colder areas we recommend some protection over winter such as straw or a fleece. This will help the strawberries to fruit earlier next year.